Whether you wear them to block the sun’s harmful rays, to hide yourself from the paparazzi or because you had one too many martinis last night, there are a million reasons to own a great pair of sunglasses! Just like apparel and shoes, sunglasses follow their own trend curve each season so check out the stylish pairs below to make sure your eyes are covered in style. In addition to lookin’ good on the outside, this pair of Jaw Bone LIVESTRONG™ shades from Oakley are also about feelin’ good on the inside. Each pair purchased benefits the Lance Armstrong foundation which supports the fight against cancer. 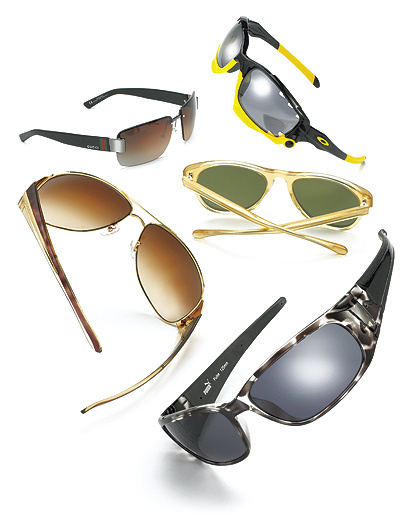 If you’re tired of going incognito in oversized sunglass styles, pick up a pair of chic, rimless shades. Gucci even agrees that it’s time to show more of your beautiful face to the world so they’ve brought back their classic rimless style with a few new twists. If you spent your elementary school years in glasses, this Oliver Peoples pair may look eerily familiar. The plastic eye glass frame style from back in the day has re-emerged as a top trend for summer. Pocket protector not included. Once made famous by the classic Tom Cruise flick Top Gun, Aviators are back with a vengeance for the hipster crowd. With gold accents and brand name labels, the new aviators are more about looking ‘fly’ than taking flight. Unique patterns and prints were all over the runways for spring apparel – and now it looks like the trend has migrated to the world of sunglasses. This funky black & white pair from Puma is the perfect way to wear a trend without going overboard.